440 - Gypsy Jazz presents a rich harmonic blend of violin and clarinet which expands the gypsy jazz tradition of Django Reinhardt and Stéphane Grappelli. At a time of year when there is a chill in the air outside, 440’s music provides the much needed treat of warmth and beauty through a jazz everyone likes. Featuring a compilation of danceable swing standards from the era of Cole Porter, George Gershwin & Benny Goodman and captivating originals by the band. 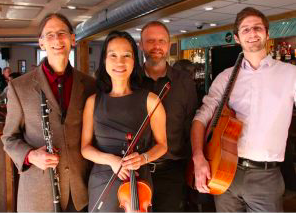 Led by Berkley trained, Japanese jazzy violinist Tomoko Iwamoto, 440- Gypsy Jazz recently released their first album “Why Why.” With Mark Chenevert, clarinet; Jack Soref, guitar; and Peter Albert de Reyna, bass. $15. Complimentary refreshments.